Our Body's Wisdom and Healing from Trauma. Krista is a Certified Somatic Experiencing Trauma Release practitioner (SE), Certified Reiki Practitioner, Certified Thai Massage Practitioner and a Certified Femme! facilitator. In her Permission sessions, she draws on her experiential immersion into body intelligence from Gestalt Therapy, Somatic Therapy, Family Constellation, Biodynamic Breath Work, Path of Love, Dalian Method, Vipassana Meditation, Osho Active Meditations, Bio Energetics, Hoffman Process, Spinal Network Analysis, Tantra, Thai massage therapy, and from movement classes with S Factor, Yoga, Djoniba Dance & Drum, Mark Morris NY, The Tango Company, and 5Rhythms. 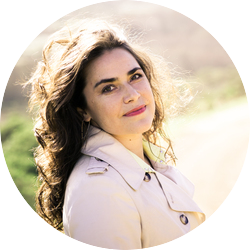 Krista Kujat is revealing how to work with our body in order to let go of whatever it is that holds us back. She gives hands-on advice that every woman can practice which draws from her experience as a certified Somatic Experiencing Trauma Release practitioner. She explains what does listening to our body actually means, and what to do with the message that comes through. Listen to this interview if you want to learn how you can heal the past through allowing intense emotions to run their course without getting caught in their story. to find the 6 pillars of intimacy, and which ones match your profile best. VIP ticket holders get a 90-minutes introductory session withe Krista Kujat at the reduced price of $50 (valued at $100). Get your VIP ticket here to redeem her offer.